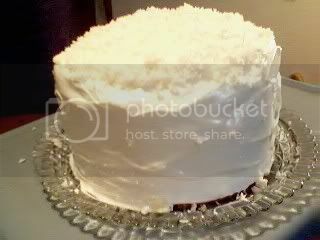 Aside from Momma Dot’s Sweet Potato Pie, another holiday must for us is her Coconut Cake. She used to make this every year, and then she taught it to me. After a while, she gave me the privilege of making this cake at every family gathering. She passed away this summer after a courageous battle with brain tumor, so she was sorely missed this holiday. This is our way of remembering and honoring her memory for she surely not only fed our stomachs well but also our souls. For an island girl like me, this is an acquired taste. I prefer my coconuts young, and have always turned my nose up on processed coconuts. But, when in Rome…you know how it goes. The coconut used in this recipe is the fresh, frozen type, thank god. I can’t stand that baker’s dehydrated coconut stuff. I’ve only been able to find this frozen variety in the South East. I tried looking for it in Los Angeles once, and couldn’t find it, so I resorted to grating my own from fresh coconut, but the mature kind. Not the soft, young, eat out of the shell type I prefer. The type of coconut for this cake is the kind we use to render coconut milk when I was growing up. The saving grace of this cake for me is the frosting. It is soft, billowy, marshmallow cream like. Yummy! The CAKE is the 1-2-3-4 recipe found on the back of the Swan’s Down Cake Flour. Cream butter. Gradually add sugar, and cream until light and fluffy. Add eggs one at a time to the creamed mixture, beating well after each addition. Sift flour with baking powder and salt. Add flour mixture alternately with milk and flavorings, beating after each addition until smooth. Pour batter into 3 greased and floured 9-inch round layer pans. Bake for 25 to 30 minutes or until toothpick inserted in center comes out clean. Cool in pans for 10 minutes then remove from pans and finish cooling on racks. Mix sugar, cream of tartar, salt, egg whites, and water in a pot or bowl over simmering water. Beat steadily over low heat with an electric hand mixer until the frosting stands in peaks, about 5-7 minutes, no more. (Overcooking will make your frosting brittle upon cooling) Remove from heat and continue to beat until thick enough to spread. Add the vanilla before spreading. You will have enough to fill and frost an 8 or 9 inch two-layer cake. Since I always make a three layer cake, I double the recipe to make sure I don’t skimp on the frosting as it has a tendency to get absorbed into the cake if you let it sit too long. When you have company though, sitting around too long is not a problem. I used two 8 oz bags of the frozen grated coconut. Momma Dot used to sprinkle it between layers and all over the cake. 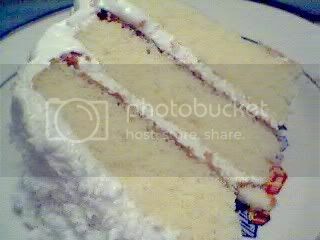 This time though, I only put some in between the layers and on top of the cake to show of the sheen of the frosting on the sides. Plus, the girls are not too crazy about the grated coconut either, so I thought I’d leave them some pristine frosting with their cake. Hi mutya, buti naman at nahanap mo an aming kusina sa internet. 😀 Salamat. Hi Manang, add the corn syrup with the initial mixture for the frosting. Add the vanilla last, after you have beaten it to the right consistency. I hope this helps. Need your answer ASAP (July 7 2006 now). I have just baked something (not this cake you posted about), but I am going to use your recipe for the (7-minute frosting). I am about to make it now, but at a loss as to where to add the light corn syrup, with the mixture (initial step) or with the vanilla? TY! Just wanted to thank you, my pastor requested that I make her a coconut cake and i looked the recipe up on line and found yours. THANK YOU SO MUCH!!!! Looks so soft and yummy! I really want to take a bite right now! Hi FishFish! I so miss young, fresh coconut too. We used to have them growing in my grandmother’s backyard and when we wanted some, just have someone climb up and get some. Now, I have to travel to have a little taste. so maligaya na ko sa patanaw-tanaw ng inyong mga cakes…and Jmom, sana makatikim (makahanap) ako nito in the future. Hi Manang! Iba talaga yung malauhog na buko ano? And fresh buko juice! I really miss that. The canned stuff just don’t compare. I can’t wait until you post the buko recipes. I’ve been meaning to try making buko pie, but haven’t gotten around to it. Hi Stel, thanks! You know, the more I think about it, I think food can be a more lasting legacy than material things. Everytime I make a family favorite, I can’t help but remember those who instilled it in us. I think it’s great that our kids can someday look at our blogs and have all the family recipes at their fingertips. what a gorgeous cake JMom! snowy…a loving way to remember Momma Dot. I can relate to you on that…I miss the young buko…malauhog at malambot. I had hoped to make a buko pie last Christmas to bring to the party with the Pinoy doctors here. My buko which I opened only on the night of the 23rd turned out to be what I was half-expecting but was not hoping for: matured. I tried to scrape slices off using spoon, but I got tired. It was just too tough. I used the fork to grate it. Hard work! Then I could not make myself go on with the pie. Then I received a package from a long-time friend who included a jar of macapuno. I hoped to use it for fruit salad, but I was disappointed with the consistency: the buko was that of a mid-age coconut, which gave me an idea about using it for the pie. So using buko pie recipe that stel gave me, I made it. Now I still have my grated coconut; not sure how long it will remain fresh, but I am thinking of making pan de coco with it.